Pullout (The Curve) Luxury Maple Blind Corner Accessories “The Curve” takes luxury blind corner storage to the next level! The individual door mountable shelves provide a custom 2-Drawer look for your blind corner, and allow for complete access to your cabinet, utilizing an amazing 775 sq. inches of surface area. All while gliding on our innovative roller coaster design; heavy-duty soft-closing slides (recommended not to exceed 60 lbs. per shelf). 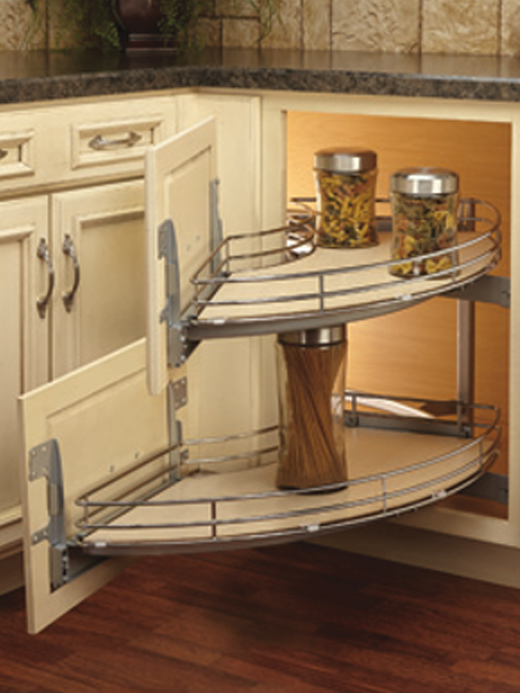 Available for left and right hand blind corners, “the curve” has fully adjustable mounting brackets that allow it to work in full height, drawer/door, or custom 2-drawer applications. For more Storage solution ideas please visit. www.rev-a-shelf.com or contact your local Lancashire office for more information.